By Robert S. Fuller Jr. While collaborating on a fashion show, Samantha Hammond, a forty-something Display Manager, draws the attention of the mysterious clothing designer Valerie Ross. Samantha’s journey of self-discovery takes her from the security of her hometown in Lexington, Ohio to the shores of a secluded paradise called Sabbatical Island. As their relationship flourishes, Samantha learns that Valerie harbors a terrifying secret. The revelation thrusts Samantha into a nightmarish world where vampires and witches dwell in the darkness. Pamela Darius, a murderous adversary from Valerie’s past, uses Samantha and those around her as pawns in a deadly game filled with seduction, pain, betrayal, and death. Robert is a fan of all things relating to vampires. It’s this obsession with vampires that makes his debut, “Valerie: Daughter of the Dragon”, the perfect vehicle to launch his writing career. Robert was born and raised in Northeast Ohio at a time when late night television stations filled their programming with old horror movies. Robert gravitated towards the motion picture vampire, but also the vampires depicted in the writings of Stephen King, F. Paul Wilson, and Robert McCammon. Robert worked at JC Penney’s, where he spent 10 years in the Visual Display Department. His love of vampires, and a decade in the retail/fashion industry, provided the inspiration to create his own vampire tale. 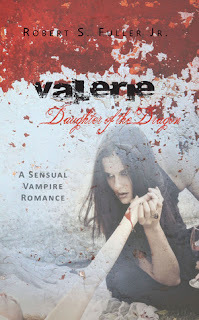 After several years of writing and re-writing, “Valerie: Daughter of the Dragon” was born. When Robert isn’t writing, he enjoys going to the movies, or listening to his extensive music collection. Robert is a huge sports fan, but prefers football and baseball to all other sports. One of his favorite pastimes is participating as team owner and Commissioner of a long running fantasy football league. 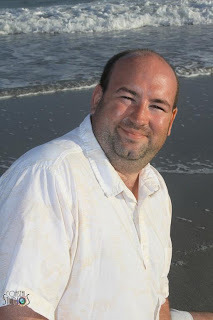 Robert manages to travel to the beaches of South Carolina at least once a year to recharge and enjoy some ocean time. Robert is married to his best friend and soulmate, Jackie. They have a son, Dustin, and two rambunctious cats, Meeps and Benny. Thanks for always having so much fabulous on your blog!! I love this cover Robert!! Can't WAIT to check it out! !